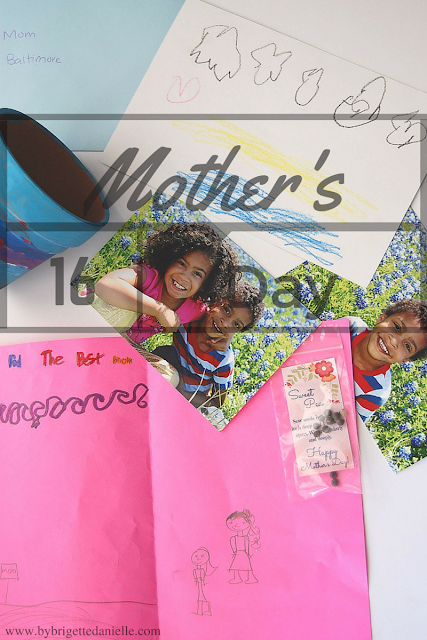 As you can see by the title, this post is all about Mother's Day and how you can spend it without your husband or with little kiddies that don't have enough loose change for flowers. Of course a simple handmade card would do or an attempt at making you breakfast. But today, as my kids got off the bus, their face grinning from ear to ear, they showed me their amazing gifts they made at school. If my kids were home schooled, younger than they are or didn't have an opportunity to create something at school... how would I feel? Would I smile and act like everything was ok? Would I be disappointed at the school teacher? Or would I simply not care? The truth is, yea I would be a little sad, not just for me but for them! They love surprising me and showing me things they made for me.. ESPECIALLY if it is a special occasion (birthday, anniversary, summer break and so on). My kiddies are very creative and when they make something they can show me, they feel beyond proud of what they have done... even more than when they complete their chores and I feed their piggy bank. Kids just want to give us the world! As you know hubby is still out of town so this will be my first Mother's Day without him. I know it's called Mother's Day but lets be honest.. the Father has a huge role in this day... I mean he did when you became a mother. And the same vice versa.. Even though my hubby doesn't care about Father's Day ("everyday is fathers/mothers day") I still do more on that day for him as the mother of his children. And I make sure they do as well! Even though I will be spending time with my sister in law, I was inspired to share some ideas that you could do on Mother's Day if you were/are alone with your young ones! 1. Portraits- Every kid grows right before our eyes, so it is important to capture special occasion photos whenever you can! If you can't afford to take professional pictures, dress up and head off somewhere that has a beautiful surrounding! Use your cell phone to take extra glam selfies. Bring a friend along so they can even snap a few. The point is to capture this special occasion with your little one. 2. Special lunch- Go out to eat at a family friendly place. Somewhere that you know they will enjoy their meal and not be quick to complain. If eating out is not in the budget, make a special lunch at home that the kids can help make. One fun lunch you can make is "Silly Faces". I found this amazing idea from Allison over at Learn~ Play~ Imagine! My kids love making all types of crazy faces! 3. Movie Marathon- Have a sitter? Take a few hours during the day and watch all of your favorite movies! Grab some wine, chocolate, comfy clothes and RELAX! In bed or on the couch, dust off a few faves and enjoy! No sitter? No problem! Pull out the super oldies and watch all your favorite childhood movies! My kids love watching movies I did when I was younger. I think they are fascinated with how old they look lol. 4. Put on a play. Have your little ones dress up in costumes and put on a production. No admittance fee required :). Kids love showing off their skills and imaginations and of course if they are making a special play for you.. even better! 5. A day at the Spa- This one is pretty self explanatory. If you can, take the time off to enjoy the peace and quiet at a spa! No kids, no hubby no noise! Just you and an amazing mud bath. If you can't make a trip to the spa, do one at home! Have the kiddies pamper you all day. Help them fill a bucket of water to soak your feet, let them "file" your nails with folded construction paper (to look like a file) and have them bring you your favorite snacks! Once your feet are done, have them paint your nails with clear polish ( that way if it spills it won't stain). My girls love to make mommy "pretty" so any chance they get they are all for it! I hope this will give you some ideas on what you can do for this Mother's Day. I know it is hard not having a day off, someone to help or not a lot of cash to do something. Just do what you can to make this day more enjoyable for you and your kiddies. Have any suggestions or comments? Let me know below!